__Mise en scene and Scenography. December 2011 - dining car of the train from Valencia to Barcelona. Coffee and newspaper. I read the headlines and I’m horrified by how unfair the political, economic and social situation is for 99% of the population. Moving at high speed, I look out the window and see an unfinished housing development pass by. Only sidewalks and streets have been built; yet another example of speculative growth without reason. I belong to a generation of educated Spanish people, eager to participate in our society but facing the need to emigrate in search of work. We have been baptized “the lost generation.” I am frustrated by the reality I’m forced to live in. I question everything. I know this disaster can’t be fixed by its creators. In Spain we have a saying: human beings are the only creatures that stumble twice on the same stone. This intrigues me. I believe theater can be a tool to express personal opinion and social criticism. Brecht thought so too and this is why designing Mahagonny is attractive to me as an opportunity to raise my voice and expose the selfish and unfair reality of our world. The engine of my creative process is the anger and helplessness born from our current economic tragedy. I have been witness to the housing and financial crisis that began in 2007. Although it’s a global crisis, I’m using the specific setting of Spain, my home country. I’m finding the characters for Mahagonny within Spanish society itself, allowing me to turn them into caricatures, just as Brecht and Weill did in the piece. In my Mahagonny, the action is surrounded by an iconic image of what most strongly represents the loss of a dream for many: an abandoned housing development. The false promises and silly use of bricks help to compose an all too familiar image for the Spanish audience. I translate the satirical moments of the script to folkloric clichés of Spanish society and create comical situations that will be familiar to the audience of Gran Liceu. · The economic crisis explodes in 2007 with the fall of a major bank. People have been getting into huge debts to afford their houses and the system has forced them to become hostages to their own lives. · The economic system has encouraged consumerism facilitating cheap credit while inflating property values. Citizens have been encouraged to purchase what they can’t afford. While in real life the economic system provides credit to keep purchasing, in Mahagonny prices are lowered to maintain consumption. While in real life if you don’t pay the system evicts you of your properties, in Mahagonny you are condemned to death. 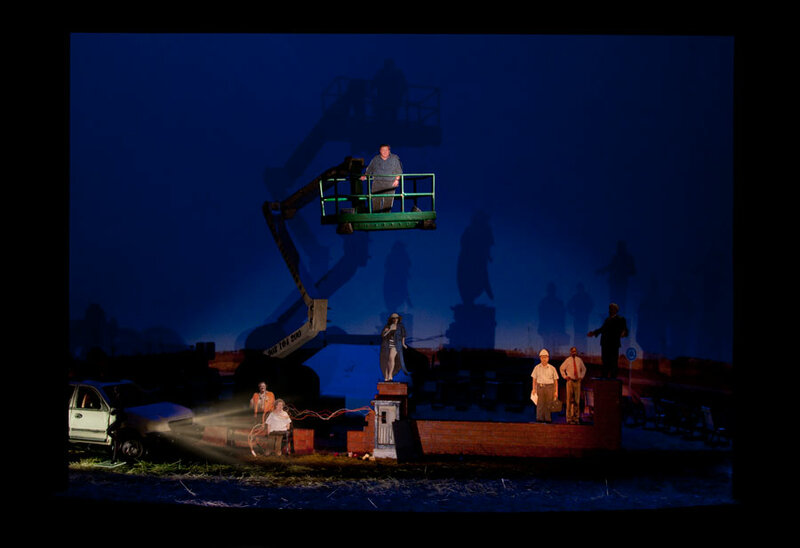 In Mahagonny a typhoon saves them. Do we need a natural disaster as well?